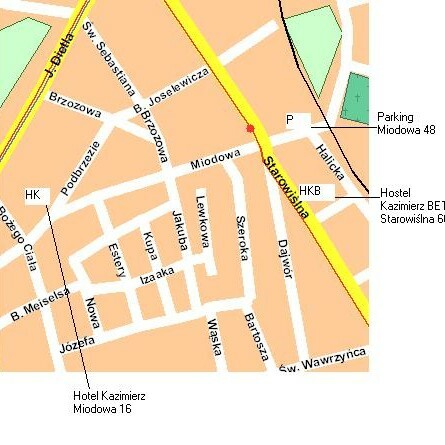 We kindly welcome to Hotel Kazimierz II which is located in the former Jewish district Kazimierz, 15 minutes walk faraway from the Old Town Square. Convenient hotel location facilitates sightseeing of the most important Cracow historical sites like Kazimierz district, the Old Town, Wawel Castle. From here famous Wieliczka Salt Mine is also ease of access. We have 23 rooms to our Guestsâ disposal: 2 single rooms 21 double rooms (with extra beds availability). Each room is furnished comfortably and equiped with private bathroom (toilet, shower), tv-sat, radio and internet access. We provide hotel quarded parking which is situated some 150 metres from the hotel. Hotel Reception desk is open 24 hours and advice important information about Cracow place of interest and help to organise a great visit in this one of the most beautiful Polish cities. The hotel is situated 1 km away from the city center. The nearest railway and bus station is 1,5 km away from the hotel. The airport is 10 km away. The hotel is accessible by trams no. : 3,13,24.